The watermelon (Citrullus vulgaris) is a coarse, trailing, annual herb with branching tendrils. The widely spreading vines often reach lengths of 12 to 18 feet and the roots spread quite as far as the vines. It is a native of tropical Africa and requires a long and relatively hot season for its best development. It is grown most extensively in the South, where it is an important field and truck crop, and also in the central states. Early-maturing varieties are grown in the North, however, the growing period frequently being lengthened by starting the plants under protection for a few weeks before setting them in the field. Since the plants require much room, they are not so common in home and market gardens as most other vegetables. The citron is a hard and white-fleshed race of watermelon. Watermelons of the Kleckley Sweet variety were planted at Norman, Okla., Apr. 19. Several seeds were planted in each hill. The hills were 6 feet distant in rows 7 feet apart. When the seedlings were well established all but the most vigorous one of them were removed from the hill. Early Development.--The first excavating was done May 20. The plants had made rather slow growth and were just beginning to "vine." Each had three or four vines varying from 3 to 12 inches in length. The taproots were about 5 millimeters in diameter and tapered to 2 millimeters near their ends at a depth of about 15 inches. One taproot forked dichotomously at a depth of 10 inches, the two branches diverging widely in the more compact subsoil. Horizontal branches began to appear 2 inches below the soil surface. These averaged about four per inch of taproot. None exceeding 4 inches in length occurred below the 12-inch soil level. Four of the larger ones were 2 millimeters in diameter and pursued a somewhat devious course to distances of 26 to 38 inches from the base of the plant. Except on the last 3 inches, of these white, fleshy roots, laterals occurred at the rate of four to six per inch. These laterals were rather uniformly 0.5 millimeter thick and 2 inches long; they were entirely unbranched, They grew in all directions but usually at right angles to the main root. The smaller branches from the taproot varied from less than 1 inch to 2 feet in length. Otherwise they were very similar to the longer ones. 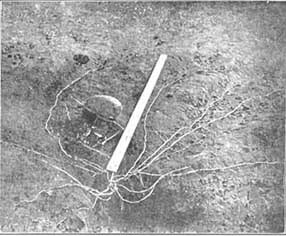 The roots rather thoroughly occupied the 8-inch furrow slice to within 1 or 2 inches of the surface but seemed to avoid penetrating the compact deeper soil. The root habit was so similar to that of the muskmelon that no drawings were made. Half-grown Plants.--A second examination was made June 10. Each of the thriving plants had several vines 4 to 8 feet long. The general habit of the root system had not changed. The chief difference was an increased lateral spread to a maximum distance of 5 feet. The depth of root penetration had increased only slightly (to 24 inches). On the first foot of taproot about 12 laterals per inch arose. On an average, 1 of these had developed strongly, 3 were of medium length, and the rest were small. Seven short branches per inch, as an average, were found in the second foot of soil. In fact little absorption was occurring at this level. Small laterals were not abundant on the first 12 to 18 inches, i.e., the oldest portion of the larger roots. But elsewhere, as on the shorter laterals, rootlets about 2 inches long occurred at a rate of 6 to 12 per inch. Tertiary branches were entirely absent. At this stage of development, however, a differentiation in the size and length of the secondary branches was taking place. Approximately 1 root per inch was making a more vigorous growth than the others. Many of these later developed into strong laterals. It is of interest to note that, the muskmelon, planted at the same time had vines quite as long as those of the watermelon, taproots of the same length, and also a lateral spread of roots of approximately 5 feet. Mature Plants.--The period from June 10 to July 26 was one of very rapid growth in the development of the watermelon. The vines, which now intermingled between the hills, were 15 to 18 feet in length. Fully grown fruits were abundant. Some had been ripe for a period of 10 days. The taproots were, 15 millimeters thick near the ground line, 2.5 millimeters in diameter at a depth of 12 inches, and some penetrated to the 45-inch level. As is common among the cucurbits, the deeper portion of the root system was relatively poorly developed. Below 12 inches only short horizontal and obliquely or vertically descending branches were found. These occurred at the rate of only one to four per inch. Below 2 feet the laterals did not exceed 3 inches in length, the last 4 inches of root end being free from branches. The surface-absorbing system had made a truly remarkable growth. It was, in general, similar to that of the muskmelon but very much greater in extent. It consisted of 24 main roots and their very extensive branches. The four largest of these had diameters of 1 centimeter at their origin and tapered to about 4 millimeters at a distance of 15 feet from the plant. A diameter of 2 millimeters was maintained to their tips. They ran 18 to 21 feet from the base of the plant. Thus the root extent exceeded that of the vines. The remaining roots were 1 to 5 millimeters thick and varied from 3 to 16 feet in length. No small absorbing laterals were found on the taproot nor on the branches near it. In fact the larger branches were devoid of rootlets throughout the first 12 to 24 inches of their course except for the 8 to 16 rather strong branches which here originated. Large secondary branches 3 to 5 millimeters thick were likewise bare for short distances. Otherwise a wonderfully well-developed network of rootlets filled the surface foot of soil, many laterals extending far into the second and sometimes entering the third foot. Major laterals arose from the main branches in large numbers, usually one or more every 1 to 3 feet. They were most abundant in the first 10 feet from the base of the plant. They diverged at various angles with the parent root but pursued a generally outward direction. Such laterals, 6 to 10 feet long, were frequent. Beyond 15 feet the branches were usually 8 inches or less in length and mostly unbranched. Although the main roots and their numerous horizontal branches were confined almost entirely to the surface foot of soil, rather numerous, vertically descending branches extended into the second foot or beyond. The surface soil was extremely well ramified with these main roots and their profuse sublaterals. The latter were 3 to 4 inches long and occurred at the rate of about eight per inch. Branching in the deeper soil was less pronounced. The vines were laid parallel to the row from time to time during the process of shallow cultivation and consequently not allowed to root at the nodes. Summary.--The vines of the watermelon, which spread more widely than those of the muskmelon, are equaled in extent by the extremely elongated, shallow roots. Month-old plants, just beginning to "vine," have short taproots with long branches only in the surface soil. Among the very numerous, horizontal branches some are 2 to 3 feet in length. Long, simple, secondary branches are very abundant. Twenty-one days later the vines are 4 to 8 feet in length. Root depth increases to 2 feet, but only a small absorbing area is developed in the second foot of soil. The lateral spread has increased to 5 feet. Of the very numerous main laterals, about 12 make a most vigorous growth. Maturing plants have vines 15 to 18 feet long and a superficial root system similar to that of the muskmelon but much more extensive. It consists of about 24 main roots and their very extensive branches. A few extend outward 18 to 21 feet from the base of the plant. Major branches are abundant and minor rootlets almost innumerable. The surface foot is a network 'of roots. Numerous larger branches extend into the second and even the third foot of soil. These (with the short branches from the taproot, which is now 4 feet deep) quite thoroughly ramified the deeper soil but to a far less degree than the wonderfully developed surface root system. Other Investigations on Watermelons.--A thorough study of the root system of watermelons and citrons at Saratov, Russia, gave results similar to those described. The seeds were sown the middle of May and root excavations were made in the middle of September when each plant had about four or five large, ripe fruits. The main root mass was found in the surface 16 to 20 inches of soil. The taproot, with a diameter of 23 millimeters, extended downward to a depth of approximately 3 inches before it began to branch. At this depth it was 15 millimeters in diameter and tapered to a thickness of only 1 millimeter at a depth of 41 inches. Here it was broken and the soil was so hard that the maximum depth was not determined. As the taproot penetrated the deeper soil, the number of laterals decreased. At depths of 27.5 to 31.5 inches only fine unbranched rootlets arose from the main root. Root Habits in Relation to Cultural Practice.--Well-drained, warm, and fertile soil of good tilth and humus content furnishes the ideal environment for the very rapid and extensive growth of the roots of watermelons. Like all cucurbits they are intolerant of poor aeration. Sandy loams are preferred and those with a clay subsoil are quite ideal, since they warm quickly and promote rapid growth but still retain moisture quite well for the shallow root system. Indeed, good crops may be grown under semiarid conditions if proper precautions are taken to preserve the soil moisture. Any soil for melons must be capable of being worked early in the spring. The melons, once planted, grow so rapidly, if temperatures are favorable, that relatively few cultivations can be given after the plants show aboveground. The strong development of the laterals in the several species of cultivated cucurbits becomes apparent early in the life of the plant. Melons only 2 weeks old were found to have a taproot nearly 7 inches long and laterals 6 inches in length, the whole occupying a soil volume approximately 12 inches in width and depth. 76 Hence, most of the soil preparation must be done before the seeds are planted. As for muskmelons and other cucurbits, the soil should be thoroughly plowed and subsequently worked to form a deep, mellow, but rather compact seed bed. It should be constantly kept in mind, in preparing and fertilizing the soil, that the seat of greatest root activity is in the surface 8 to 12 inches. Like other cucurbits, watermelons are transplanted with difficulty unless the roots are protected from disturbance by growing the seedlings in inverted pieces of sod, in pots, bands, or other containers. Under such treatment they have the advantage of a longer growing season and better protection during establishment from insect enemies. After a few weeks they are transplanted into the field without checking their growth. Watermelons respond to the usual benefits of cultivation if the root system is uninjured. The objects of cultivation are to remove competing weeds and make a more congenial environment for root development. Early tillage is beneficial in preventing crusting of the soil and subsequent difficulty in the emergence of the large cotyledons; in promoting better soil aeration, and in conserving moisture. It should be understood that root growth often exceeds that of the vines and takes place simultaneously; the roots are near the surface and beneficial cultivation must be shallow. Pruning the vines, as with sweet potatoes, is a harmful practice and not in common use. 9 Any injury to the food-making portion of the plant probably results in a diminished root growth and smaller fruits. The common practice of pruning the smaller' melons has a different physiological basis which is entirely scientific.